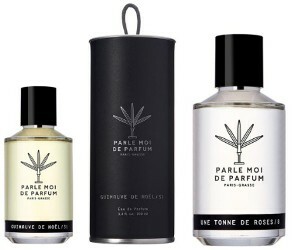 Parle Moi de Parfum is a new French niche brand from Benjamin Almairac, introduced this past fall with eight new fragrances developed by his father, perfumer Michel Almairac: Cedar Woodpecker, Flavia Vanilla, Guimauve de Noël, Milky Musk, Tomboy Neroli, Totally White, Une Tonne de Roses and Woody Perfecto. Cedar Woodpecker ~ Cedar and iris. Flavia Vanilla ~ Dark and sweet. Guimauve de Noël ~ Orange blossom and vanilla sugar. Milky Musk ~ Creamy musk and sandalwood. Tomboy Neroli ~ Neroli, orange blossom and amber. Totally White ~ Lilac, hawthorn, mock orange and wisteria. Une Tonne de Roses ~ What it says. Woody Perfecto ~ With coffee, leather and vetiver. Parle Moi de Parfum Cedar Woodpecker, Flavia Vanilla, Guimauve de Noël, Milky Musk, Tomboy Neroli, Totally White, Une Tonne de Roses and Woody Perfecto are available in 50 (€95) and 100 ml (€155) Eau de Parfum. Hooray eight more on the heap. I don’t know how anybody could ever hope to keep up. It’s worse than television, just an endless deluge. I wonder how far you can go in Paris without running into a single-brand perfume boutique? Claude Dir’s daughter started a brand too, which I haven’t gotten around to announcing yet, and Jean-Michel Duriez has his own fragrance in a pop-up shop in Paris at the moment, and you’ve got Sylvaine Delacourt’s new brand, and Jean-Paul Guerlain’s new brand, and a gajillion others I don’t even know about. I think they’re like Starbucks or Duane Reade in New York, one on every street corner. I’ve honestly given up. In the eighties and nineties I tried literally everything that came down the pike, in the 2000s I made lists of things to look for, but now I’m defeated. I sniff maybe one out of every hundred new things (not even that, really), just in case I stumble across something wondrous that I can’t live without. I sniff less and less every year, so I guess I’d say I’m defeated too. I think being spoiled for choice can be a bad thing — and I think it’s very bad for the industry. It’s rather comical how 5 years ago, everybody wanted to be niche, now brands go out of their way to explain why they’re NOT niche. Love the names! And sign me up for woody perfecto, cedar woodpecker and tomboy neroli. The names are fun, agree. I wish there’s a discovery set of this! I’m late to the game but Luckyscent just got these and has a sample bag of all of them for $24. A good way to try them.